Of all the things I would have guessed to be absolutely bursting with flavor, it wouldn't have been tomato soup. 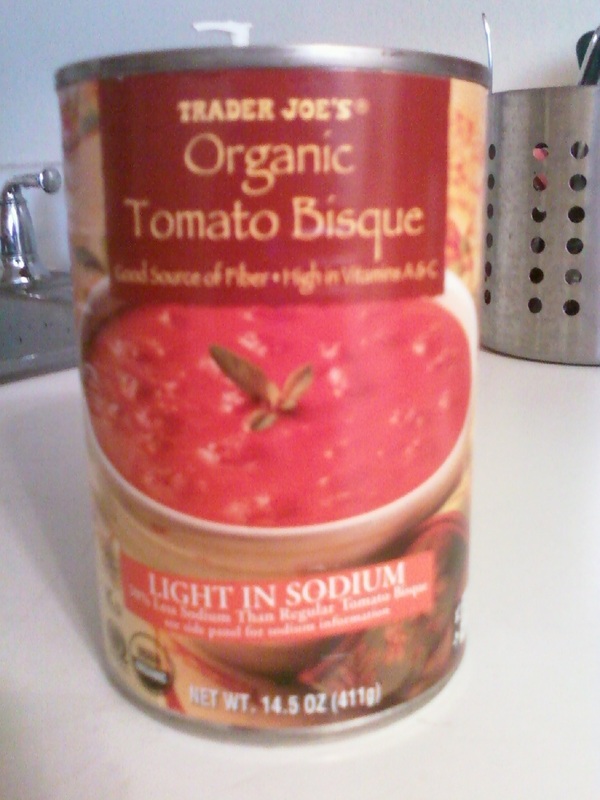 But this tomato bisque is quite possibly the best tomato-based soup I've ever had of any brand, anywhere. Sonia and I like to grill up cheese sandwiches on the George Foreman and dip them in this soup. Simply amazing. We use whole wheat bread or multi-grain bread with Havarti cheese. That seems to go pretty well with this bisque. But just by itself or with saltine crackers is good, too. We haven't tried it yet, but I bet you could use this as a sauce for pasta. Pick it up for $1.99 a can. I give it Five out of Five Stars. Sonia does, too. Bottom line: 10 out of 10. I must respectfully disagree. This may be the worst tomato soup I've ever had! Too sweet. 14 grams of sugar! Blech. This soup is amazing! The TJ I go to always sells out of it. I've been looking for it in other stores - even the Monrovia store (home of TJ) is sold out! They probably stopped carrying it. I keep my eyes out for it though. @Lunacrash - Yes, TJ's discontinued ut but it's actually the same soup as Amy's Low Sodium Chunky Tomato Bisque :) Enjoy! It sounded like Amy's and, if so, it's delicious. I wonder if it's actually produced by Amy's with the TJ label? It's on my list.